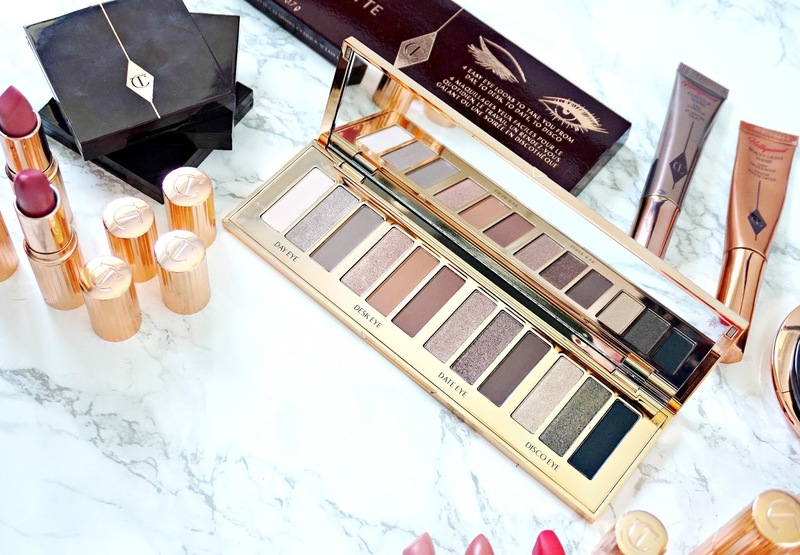 Charlotte Tilbury Instant Eye Palette - do you need it? 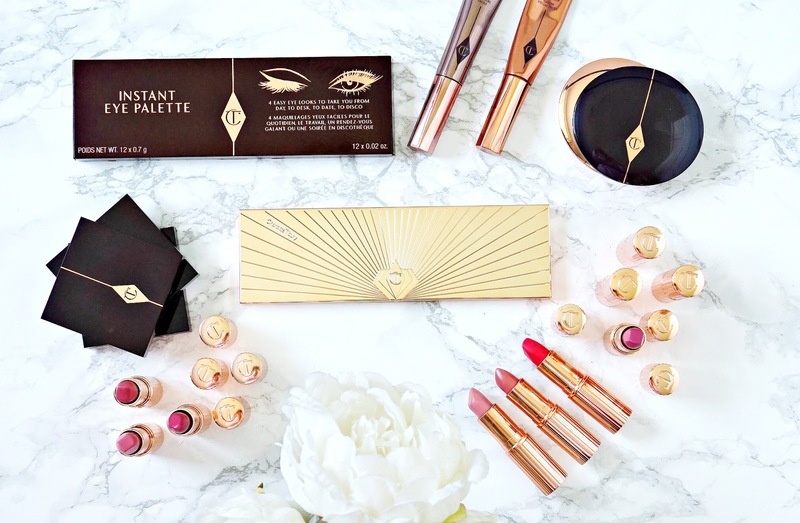 If you have read my blog for any amount of time, you will know that I am a huge fan of Charlotte Tilbury - the lady herself and her products. (See Brand Focus post here.) I love the whole aesthetic of the brand and the quality of the products - I know the price point is high but this is a luxury brand and the prices are on a par with YSL, Dior etc yet still a lot less expensive than Tom Ford. I bought some products from her recent Hollywood range (review here) but the product I was most excited about was her Instant Eye Palette, which is due to be released this Thursday, but my husband kindly treated me to it when it was in a 24 hour presale last month. I have mixed thoughts on it and want to share them with you today. First of all, I want to apologise for the lack of swatch photos but at the moment I have very little power in one of my arms due to my illness, which is making things difficult for me. However, I hope that the close up of the shadows will help. I have three of Charlotte's eyeshadow quads, which I love but they are priced at £39 each so when I saw that this palette, which contains 12 shadows was £60, I was pleasantly surprised. Meanwhile, back in the real world where not everyone is a makeup obsessive, my husband was shocked when he saw the palette and couldn't believe that I thought it was "good value" - you can make up your own mind on that one, depending on how much of a makeup fanatic you are! The Art Deco packaging is stunning, in my opinion. It is similar to the Filmstar Bronze & Glow case with a sunburst design and inside are the 12 shadows, divided into 4 sections, with 3 shadows for each look: Day Eye, Desk Eye, Date Eye and Disco Eye. The idea being that this is a complete palette no matter what the occasion in your life, which is perfect for people who don't own a lot of palettes or a lot of shadows, in general. There isn't a brush included, which is fine by me as I rarely use the brushes included in palettes, although I think some people may not agree as the whole point of the palette is that it should take you from day to night so you will need to carry an eyeshadow brush in your handbag if you intend to use it in that way. Now on to the shadows themselves - each trio has a prime, enhance and smoke shadow. First up is the Day Eye, which disappointed me a little because the prime shadow (which is a cream matte) is not very pigmented at all and doesn't really show up on my skin. I have to layer it quite a bit for it to be noticeable - this is not a problem that I had with any of the shadows in her quads. Not a good start! The enhance shadow is a neutral taupe/brown shimmer and thankfully it is more pigmented than the previous shade and the smoke shadow, which is a mid-brown matte is moderately pigmented. Overall, this trio isn't very special but then again, it is a day look so it wasn't designed to be very full on. This was the first trio that I wore and whilst I wasn't overly impressed, my husband asked had I done something different with my makeup that day because he thought it looked beautiful - so maybe I was being overly fussy. Disappointment aside, the shadows lasted really well on my eyes and basically didn't budge until I removed them that night. 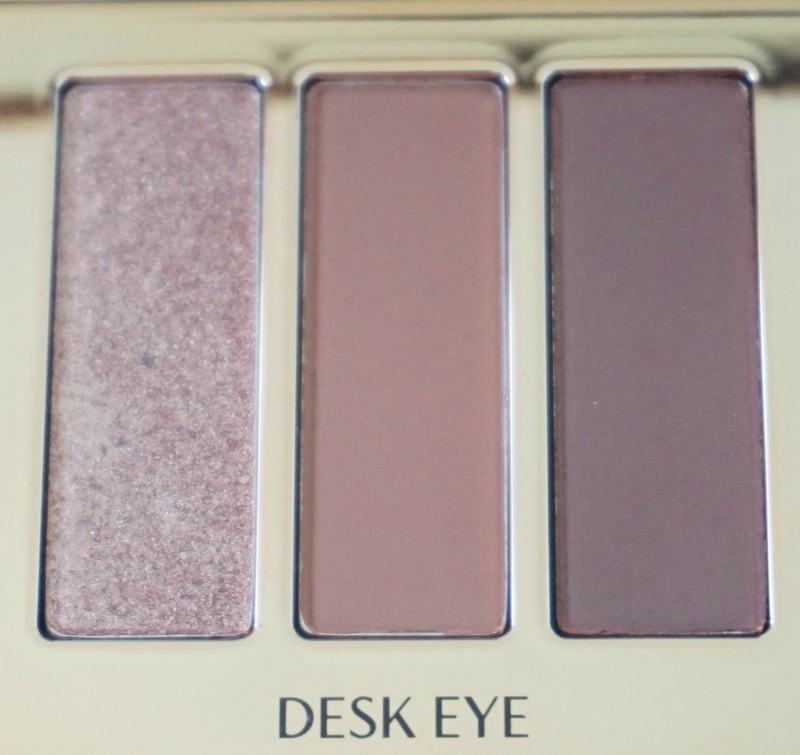 Next up is the Desk Eye, which is more successful in terms of pigmentation although the shadows still aren't as pigmented as Too Faced or Anastasia Beverly Hills, for example - which some people will see as a good thing. The prime shadow in this trio is a pink champagne shimmer, which has a beautifully soft texture. The enhance shadow is a warm terracotta matte - much warmer than it appears in the pan and the smoke shadow is a soft chocolate matte shade. I really like this trio - particularly the mattes as they're what I normally go for in a daytime look. 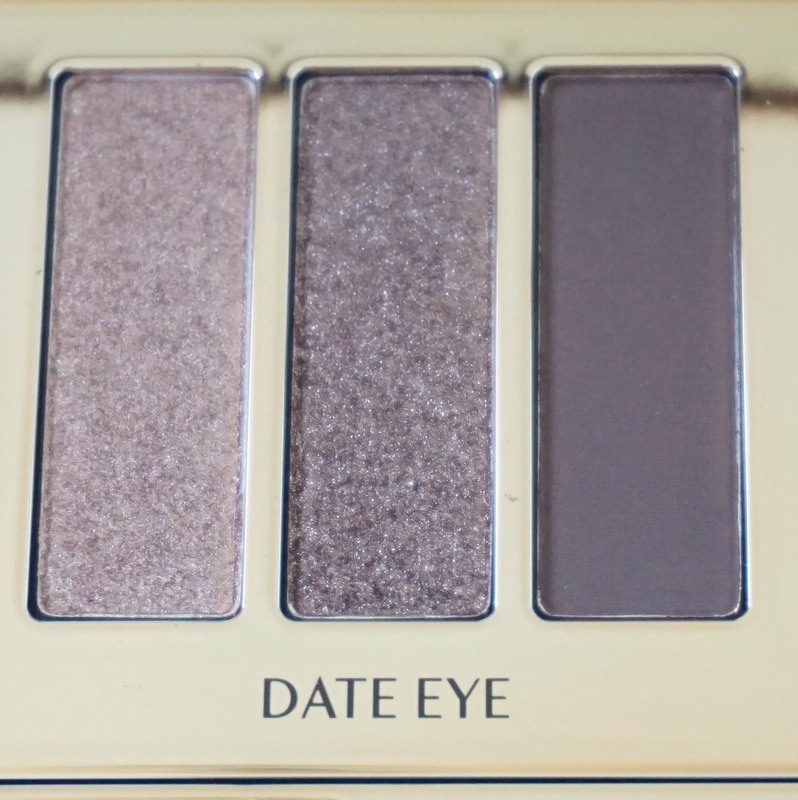 The Date Eye Trio is my favourite of the four and the one that I will get most use out of. The prime shadow is a beautiful beige toned shimmer. Please note that the shimmers are not glittery or chunky - they are all very smooth and apply effortlessly. The enhance shadow is a bronze shimmer and the smoke shadow is a dark brown matte. 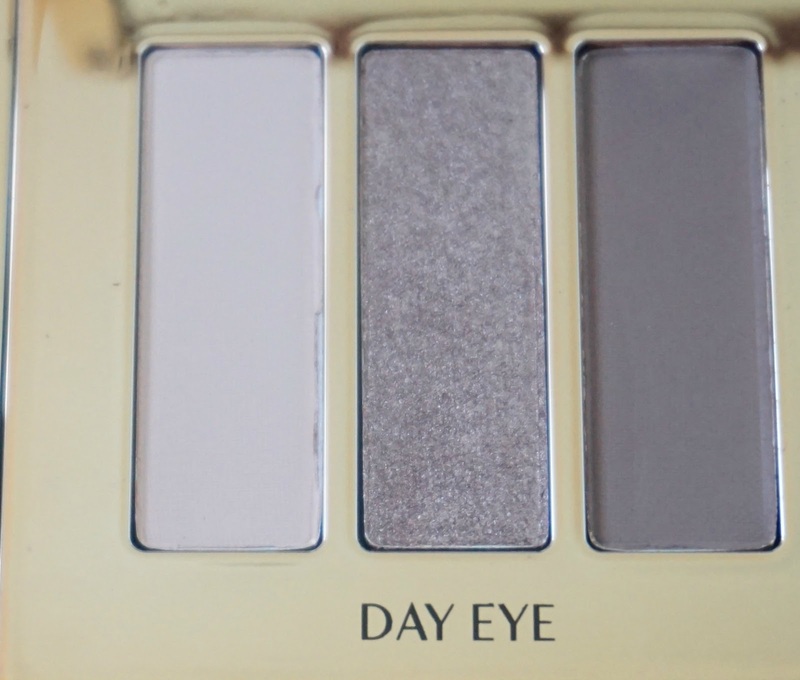 These three shades work really well on my green eyes. 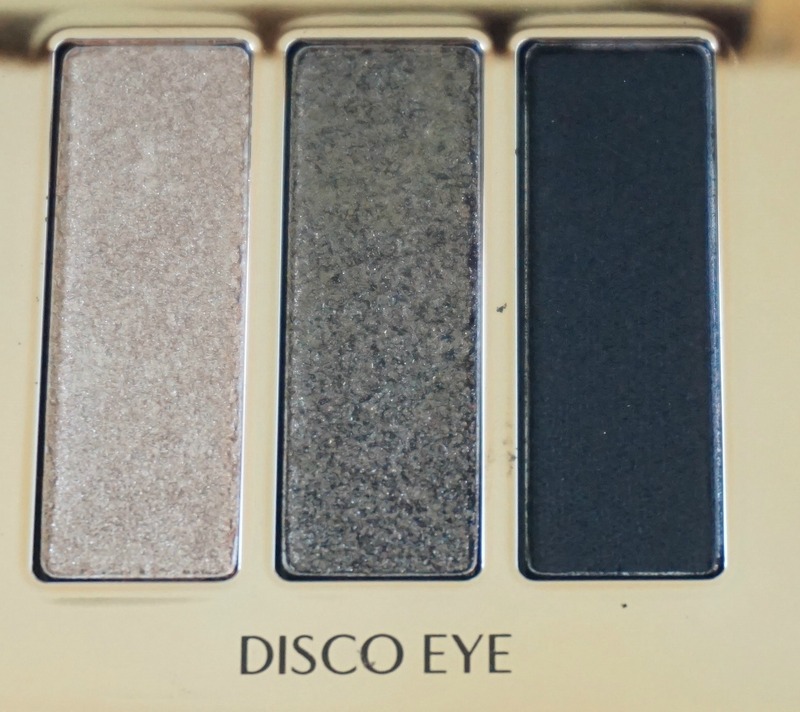 Finally we have the Disco Eye. The shadows in this trio are the most pigmented in the palette. The prime shadow is a warm pale gold shimmer, the enhance shadow is an olive toned shimmer (really beautiful shade) and the smoke shadow is a black matte. Admittedly, I have only used this trio once since getting the palette but I really love the three shades together and I think I will get more wear out of this as the festive season approaches. There is almost zero fall out in the pan or on the face with these shadows. The texture of the shadows is easy to work with, which is a big plus given that the pigmentation isn't outstanding in some of them. A big positive of this palette is that even beginners could create a nice look with it, unlike Anastasia Subculture for example and the fact that it is divided into 4 trios will also help a lot of people out who are sometimes unsure of which shadows will work together. I love that it contains a matte black - something I think all palettes should have. Overall, there is nothing groundbreaking about the shade selection, but they all work. 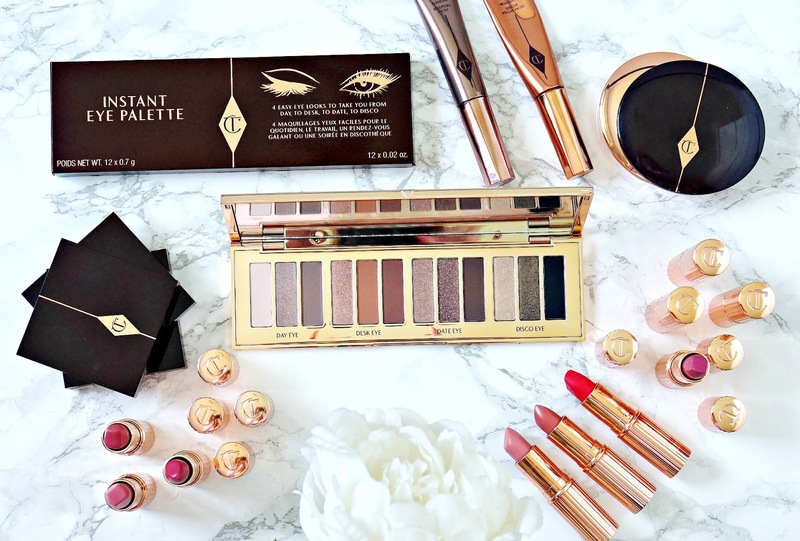 If you don't already own a neutral palette, you will love this or if you are a die hard Charlotte Tilbury fan, you will love this but do you need it? I think only you can decide that - there are other similar palettes on the market for less than £60 but then again, none as pretty as this one. I am hoping Charlotte follows this up with another palette that contains more variety - some of the russet, bronze and purple tones that are in her single quads. What are your thoughts on this palette? Will you be buying it or have you already bought it? I'd love to hear!